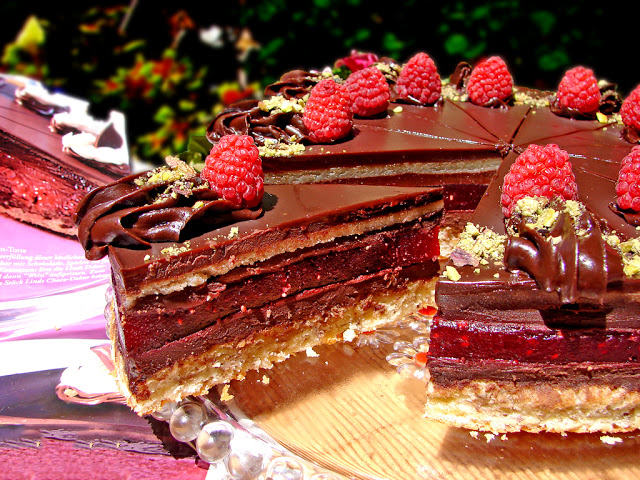 A chocolate raspberry cake is one of the best cakes I have ever prepared and tried. Extremely fine and stylish. Laffer’s recipe, so welcome! For swamps, whisk the butter with powdered sugar. Add yolks, cream and vanilla. Finally, mix the cream with the sugar-crushed proteins, flour, and nuts by alternating them. Stir gently with a blade. Pour the dough into a 26 cm cake, covered with baking paper. Bake the marsh in a heated 180 * oven for about 20 minutes until it is radiant. Remove the swamps from the oven and let it cool down. , do not put sugar in the cream. For raspberry jelly, squeeze the fruit with sugar. Cook for 2-3 minutes. Pass it with a blender and rub it all through a strainer. Heat the gel in a water bath soaked in some cold water. Once it is dissolved, mix it with raspberry puree and mix well. Allow the jelly to cool to room temperature before putting it in the cake. At the bottom of a tortelline, place the swamps and tighten it with a removable ring. Cover the ring on the inner side with acetate tape so you can then easily remove it without damaging the appearance of the cake. If you do not have an acetate foil, you can buy more flexible polyethylene folders – a pocket from the bookstore and make a strip of them. For a better view of the swamps cut its edges as the board of the cake is not plastered with cream and is visible. On the swamps pour 1/3 of the cream by gently warming it before. 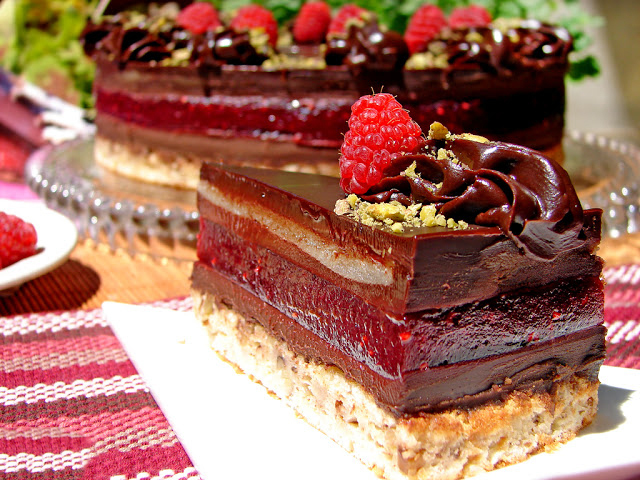 Spread it evenly with a spoon and leave the cake for 10 minutes in the refrigerator. This is enough to tighten the ganache. Spread the raspberry jelly on the cream. It must be cold, but it has not begun to gel. Put the cake back in the refrigerator again for 3-4 hours until the jelly is tight. On the raspberry jelly, apply 1/3 of the ganash cream, warming it slightly again. You can also do this in a microwave for 10 seconds. Spread evenly and store in the refrigerator to tighten the cream. Roll the almond marzipan on top, sprinkled with a little powdered sugar. Roll a circle with the diameter of the cake and put it on the second layer of cream. Finally, warm again the ganase that is left and pour it on top as a glaze. You can leave a small part of it for decoration if you like the one I have done. Put the cake in the fridge for 1 night. Before serving with a hot knife, mark the cake in pieces. Put the remaining ganache in the syringe and decorate the triangles. 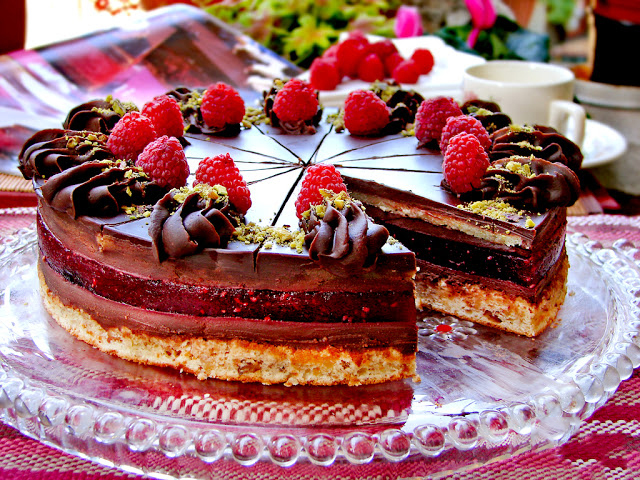 Garnish with raspberries and sprinkle with a little chopped pistachios. Enjoy!